An unprecedented operational and postural comfort to the practicing dentist, assistant, and hygienist. An unprecedented stereoscopic 3D visualization, ushering a new paradigm in evidence based clinical decision-making to everyday practice. A new platform for clinical education. The magnified stereoscopic 3D clinical teaching model dramatically improves the efficiency and proficiency of clinical education and learning comprehension. 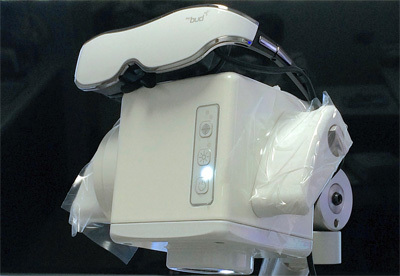 The unobstructed view of a well illuminated and magnified operating field, seen in real-time or recorded stereoscopic high definition video of a clinical dental procedure, as seen from the perspective of the operator, provides a new clinical teaching platform that will improve communications and eliminates misunderstandings and misconceptions in the clinical learning process for student, colleagues and patients alike. It can expand the one-on-one clinical teaching model from 1:1 to 1:∞ via the web. Stereoscopic vision requires two eyes viewing a three-dimensional object from two different perspectives simultaneously to produce and image with depth perception. The MoraVision™ system raises the level of your dental practice through Magnification, Expanded Visual Access with Posture Independent Vision Ergonomics, Operating Comfort, Real Time Visual Communications, and Visual Documentation. With magnification levels up to 16x, MoraVision™3D improves your ability to see, diagnose, and treat early clinical problems before destroying a large mass of tooth structure and supporting periodontal tissues, and avoid future catastrophic loss of teeth and supporting bone. Early problem are usually invisible to the naked eye or even with the average 2x-4x magnification loupes. Magnification levels above 10x will allow the dentist to provide precision treatments without the usual collateral damage to unseen adjacent teeth and soft tissues. MoraVision™ takes dentistry from the Braille age to the seeing age with precise, minimally invasive, complete, truly preventative and gentle dental care. Well informed and educated patients will benefit. Raised levels of clinical competence will save your back and your health. 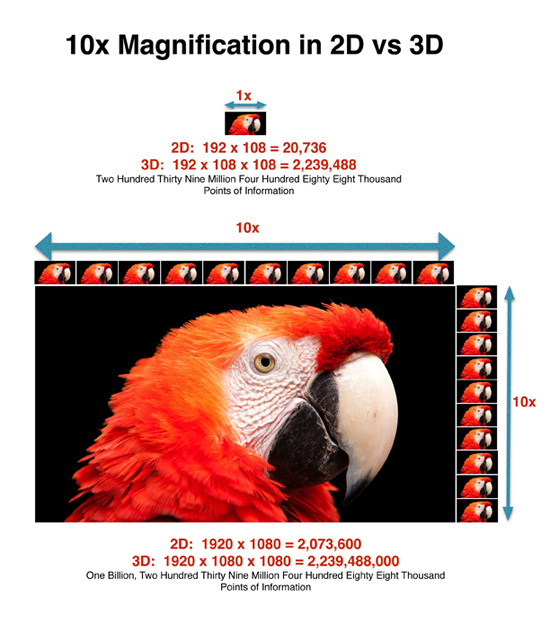 The illustration provides a graphic representation of the power of magnification and how it relates to information content. When patients can exercise visual control, they become partners in solving their problem and moving toward preventative dentistry. The optional HMD (Head Mounted Display) will allow the patient to view the operating field in Real Time. This is a most effective practice builder. 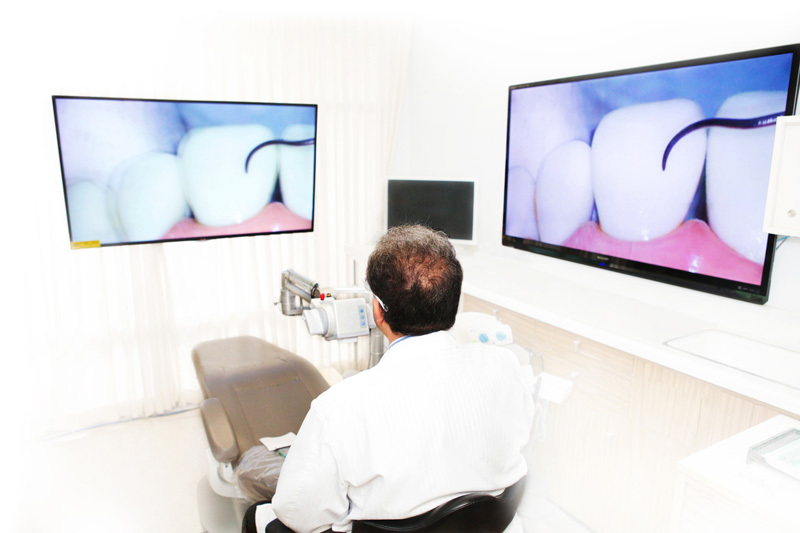 It is based on educating the patient by allowing them full participation in experiencing the quality in the delivery of dental care. For patients, dentistry has been a faith based endeavor. With MoraVision and an HMD for the patient, dentistry becomes a known quantity and quality that serves to eliminate patients’ fears of the unknown and the resulting anxiety. By giving our patients visual control and equipping them with the visual knowledge of their own oral cavity, we empowers them to become better, happier and loyal patients who appreciate what we do for them. When I switched to MoraVision both my assistant and I feel less rigid and more relaxed, it is operating freedom. Thank you Assad Mora, you’ve changed the game! MoraVision™ is the highest caliber, teaching tool available to institutions today. Before students could view a playback catalog to learn critical procedures. Now, instructors can use the system for viewing purposes in real time as you teach. Students and faculty won’t have to wait until the procedure is complete to critique outcomes. Instructors can guide students while they work and avoid tremendous mistakes. MoraVision will usher a new era in clinical and preclinical dental education. Interactive clinical teaching model based on true visual evidence with up to 16x magnification, where the teacher and the student can see the exact same thing in question leaving no room for conceptual misunderstandings. Interceptive clinical teaching model based on having MoraVision in each cubical. The teacher can now see exactly whatever the student is doing at any given time. The teacher can intercept accidents in the making, and show the student what should be done and how to avoid getting in trouble before it happens. The teacher can sit down and demonstrate a part of a procedure to the particular student or to the whole clinic simultaneously. Students will gain valuable insight from these short demonstrations before they are faced with similar situations. Informative clinical teaching model based on capturing and recording those moment instantaneously and without interruption to work flow. These procedures can be recorded catalogued and added to the 3D video library that can be accessed any time for future reference. In addition the teacher can be narrating what he’s doing and why, and the integrated microphone will pick up the sound and transmit it to the ears of the students watching the demo either live or recorded. The same 3D video and sound can be transmitted to the lecture hall. MoraVision will not only help the student see what the end result should look like, but how to get there. Assessment of the student’s progress can be substantiated with visual documentation and records. These are only a few ideas on how MoraVision can transform clinical education which is the backbone of dentistry, not to mention remote clinical assisting and assessment. Come see us at Booth #1120 and Test drive MoraVision™3D system. Find out why this paradigm shift in Vision Ergonomics is fast replacing naked eye dentistry, loupes and legacy microscopes. MoraVision™3D: Changing Vision Ergonomics and achieving the basic tenants of dentistry with comfort and postural freedom. Join us for a full day course and test drive the MoraVision™3D System. MoraVision™ is a proud sponsor and provider of technologies for the live 3D event on Friday afternoon: Virtual Treatment from Diagnosis to Prosthetic Care (Streaming Live in 3D from the University of Illinois in Chicago and Presented Live Onstage in 3D) In addition, come see us at Booth #418 and Test drive MoraVision™3D system. 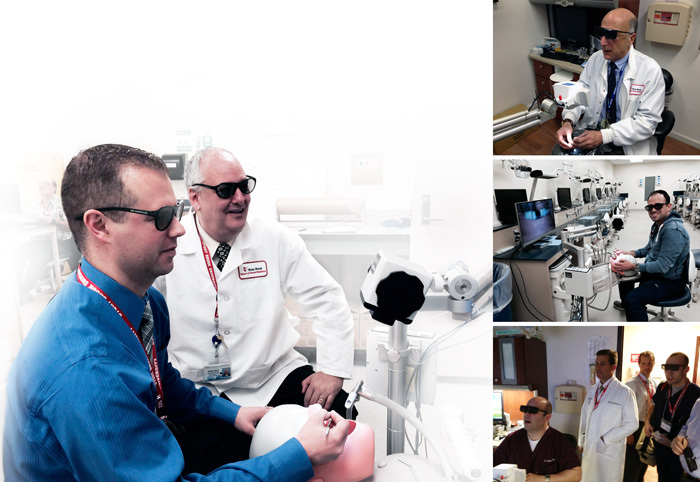 Find out why this paradigm shift in vision ergonomics, work ergonomics, clinical documentation, and dental education is fast replacing naked eye dentistry, loupes and legacy microscopes. Come see us at Booth #2255 and Test drive MoraVision™3D system. Find out why this paradigm shift in Vision Ergonomics is fast replacing naked eye dentistry, loupes and legacy microscopes. Come see us at Booth #254 and Test drive MoraVision™3D system. Find out why this paradigm shift in Vision Ergonomics is fast replacing naked eye dentistry, loupes and legacy microscopes. MoraVision is a proud sponsor of this wonderful AAE program for Endodontic residents gathering from around the USA. Residents and guests will have the opportunity to see and test drive the MoraVision™3D System and find out why it is fast replacing legacy microscopes. This video highlights the MoraVision exhibit at the AAE 2015 meeting in Seattle, WA. You will see Dr Dennis Brave of RealWorldEndo interviewing Dr Assad Mora, Inventor and Founder of MoraVision. The MoraVision™ system is revolutionizing dentistry. Click on an event to view information/photos. Advanced Endodontics Hands-on Course with Moravision • December 19-20, 2014 • Dr Josef Diemer at Jadent MTC in Aalen, Germany.